Want to get out on an adventure ride? Marin County, just north of the Golden Gate Bridge is a great place for mixed terrain jaunts, whether it’s to avoid car traffic, get great views or just feel away from it all so close to San Francisco. For the day, or on a multi-day adventure, you’ll find great country roads and trails to ride. Load up your mountain, gravel or touring bike and get yourself to Fairfax, a quiet little throwback town known for live music, hippiedom and mountain biking. We rent gravel bikes by reservation next to the Marin Museum of Bicycling too if you need one. 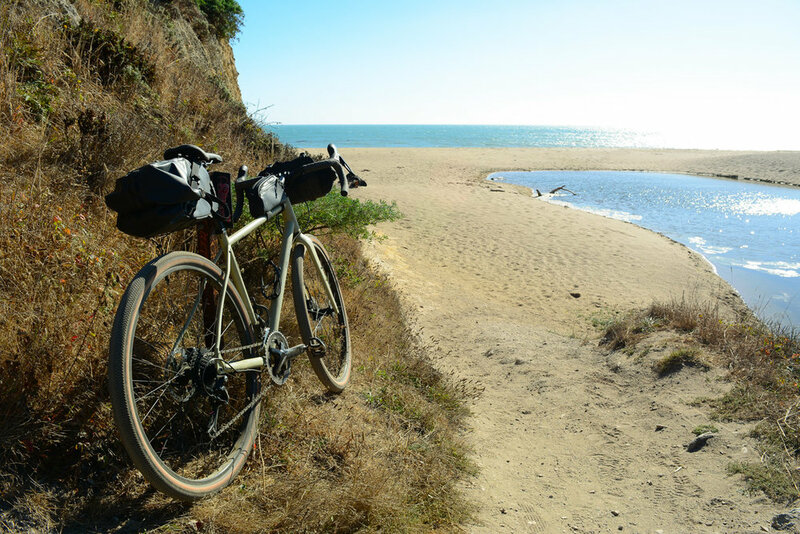 There are several routes out to the coast, all depending on whether you want to stick more to the road versus maximizing dirt, and where you plan to camp for the evening. The easiest campground to get to, with least amount of climbing, it’s mostly paved road out to the Pt. Reyes Hostel and then 3 scenic miles of dirt road. Close to the beach, but protected a bit from the breeze, the only thing Coast lacks is shade. Coast Campground has a water faucet (I’d bring a small water filter just in case) and vault toilets. Our recomendation if you plan to stay for a bit. It’s a steep climb in and out, but the seclusion of the beach is worth it if you plan to spend some time. We highly recommend watching the sunset, or taking a stroll to Alamere Falls (2 mile walk from Camp). Wildcat also has water and vault toilets. Hit the road from Fairfax and take mostly road out to Coast Camp on Pt. Reyes. 29 miles each way from us, this is a fairly mellow way to try bikepacking. You can head straight out, or take Platform Bridge Road through Pt. Reyes Station to pick up supplies on the way. Or stop in Pt. Reyes on the way home for a morning bun and coffee at Bovine Bakery, or a meal at several delicious restaurants in town. 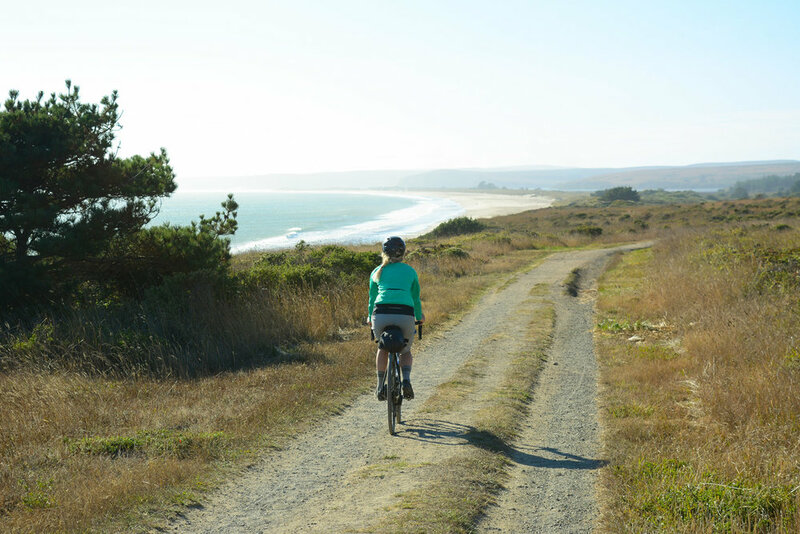 You can stay at the Point Reyes Hostel if camping isn’t your thing, or take the 3 mile coastal fire road out to Coast Camp for a evening by the beach. 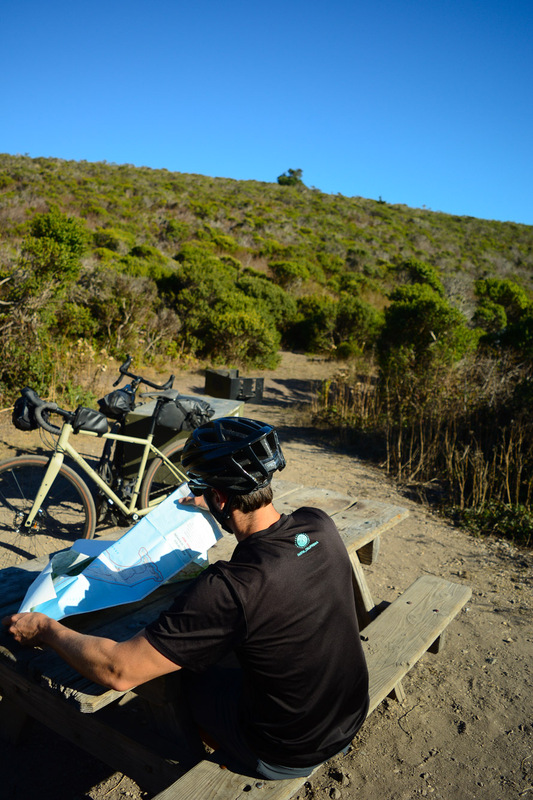 Point Reyes Hostel vs. a scenic pedal out to the coast. For 1 night, We’d be tempted to skip cooking and bring burritos, a couple of beers and then bars for the morning before pedaling into Pt. Reyes Station for something to warm you up. Or bring a lightweight camping stove or burner for coffee and stay awhile to stroll the beach and explore. A classier version has us picking up Cow Girl Creamery cheese, bread and a bottle of wine on the way out to the coast to watch the sunset in style. 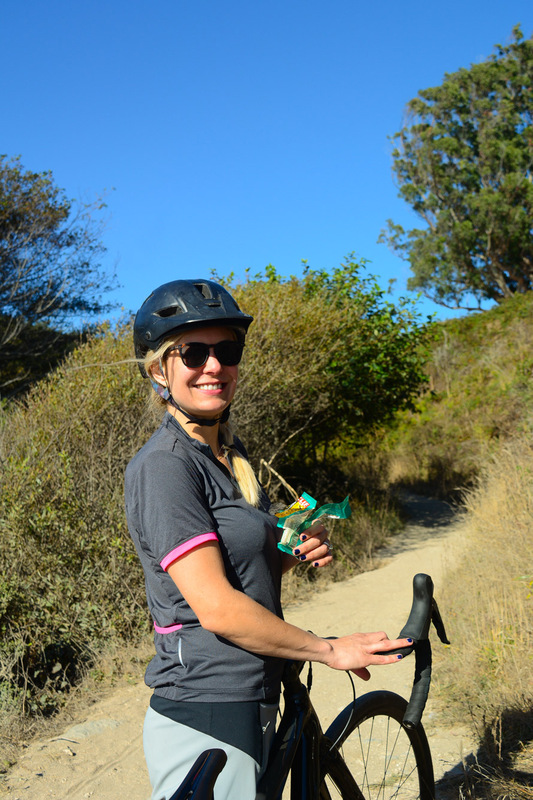 On the way home you can opt to lengthen the ride by coming back via Fairfax-Bolinas Rd. or via a dirt climb up Randall Trail to Bolinas Ridge to add some more elevation to your adventure. 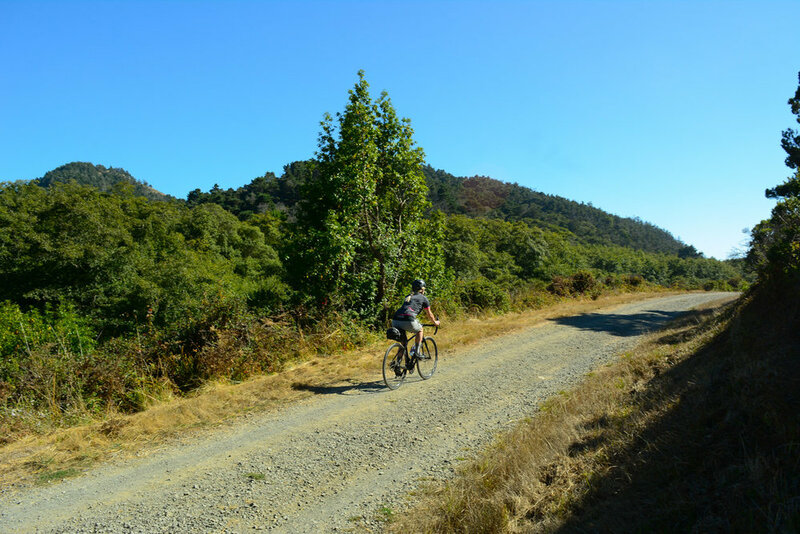 If you are taking your time and can handle some climbing, we like to stick to more dirt and head up Deer Park Fire Road out of Fairfax to Fairfax-Bolinas Rd. If you opt for the road Fairfax-Bolinas rd is also quieter than Sir Francis Drake, but with a healthy elevation change! You can then take Bolinas Ridge Trail and drop down either Randall fire road to Highway 1 (if headed to Wildcat Camp) or take it all the way to Sir Francis Drake if heading to Coast Camp. You could also go over Pine Mountain to the San Geronimo Valley and pick up the cross marin trail or Sir Francis Drake. The route options are many! If you want to spend 2 nights on the coast we’d recommend Wildcat Camp to spend some time relaxing on the coast, or exploring the hiking trails around. After two nights and a full-day at Wildcat, I’d make sure to check out Pt. Reyes Station and if you take your time, then camp at Samuel P. Taylor for a night under the redwoods. From there you have an easy pedal back to Fairfax or the Larkspur ferry. You can also take highway 1 south to Stinson Beach and climb back over (dirt or road) to Mill Valley or keep going to SF. Make sure your bike is in good working order (or rent one of ours). A mountain bike will work if you can carry all your gear, and a road bike will work if you have wider tires, but a gravel bike with relaxed geometry, cushy 30mm+ tires with some grip handles mixed terrain the best. We love our Specialized Sequoias. A multitool. I also like a leatherman type tool with a knife for overnighters. Any cooking supplies you will need, don’t forget your spork! For overnight trips we’re tempted to just pack a burrito and a couple of beers, and maybe a thermos of coffee and some bars for the morning. A lightweight burner can be a godsend for cooler mornings though when you want some oatmeal or warm coffee to help rouse you from a cozy sleeping bag.